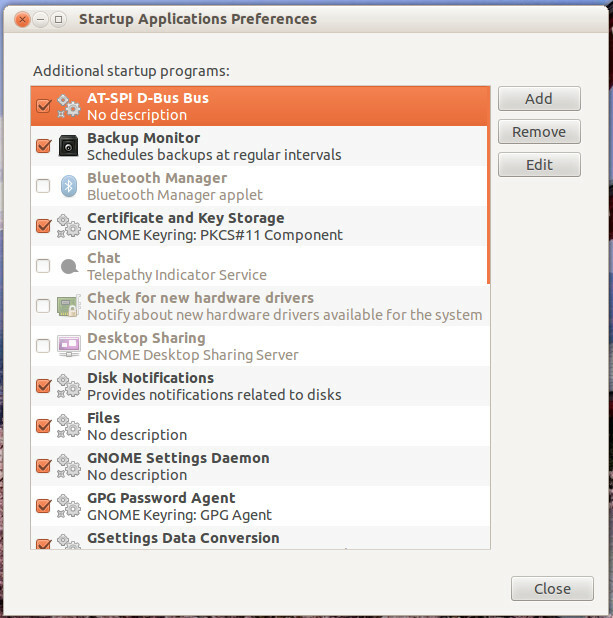 Starting with Ubuntu 12.04 the 'Startup Applications' manager now only displays a sub-set of applications to control at startup with the remaining applications being hidden. Copy and paste the following command into the terminal and press the 'enter' key. You will have to provide your user account password to perform the command, if asked simply enter your user password and press 'enter' again (note: When entering your password, the terminal will not display characters on-screen, such as the asterisk '*', for security reasons). Close the terminal and now open 'Startup Applications' from the power menu or searching for it in the unity bar. Hidden startup applications will now be displayed in the 'Startup Applications' manager as slightly greyed out. You can now continue to edit which programs start upon startup, including any hidden applications. when you go to gear upper-right on unity you right click and there are the Start Up Apllcation that you give in a command . ..
Ubuntu Linux is very simple for windows user :P why you said that ? Yes one command .. *So* ? This tip is for Power users. Regular users don't even know that there are hidden apps. So this is why there is a ONE terminal command. @jemadux Since Ubuntu 12.04, every link (.desktop files) in /etc/xdg/autostart/ has the NoDisplay property set to True, which hides the link in the Startup Applications Preferences window. Before blindly defending Ubuntu, consider how "easy" it seems for a Window user to enter a sed command in the Terminal just to get control over what runs at startup. I love Ubuntu too, but I think the decision to hide *every* startup item by default is completely asinine and is exactly what Windows users will dislike. I'm not sure what you're getting at here. Short of manually editing every single file in /etc/xdg/autostart, sed is the only logical way to change this by-design behaviour in one concise command.